Antwerp Central Railway Station is the city’s main railway station. The original building was constructed between 1895 and 1905, and served as a replacement for the original terminus of the Brussels-Mechelen-Antwerp railway. The stone terminus building, with an impressive dome above the waiting hall (75 meters high! ), was designed by Louis Delacenserie, a Belgian architect from Bruges. On special request of King Leopold II, Delacenserie used the station of Luzern (Switzerland) and the Pantheon (Rome, Italy) as his source of inspiration. The train shed (185 meters long & 44 meters high) was engineered by Clement van Bogaert and built out of steel and glass. Although it’s difficult to assign Antwerp Central to a particular architectural style due to Delacenserie’s eclecticism, the station is considered by very many as the finest example of railway architecture in Belgium. 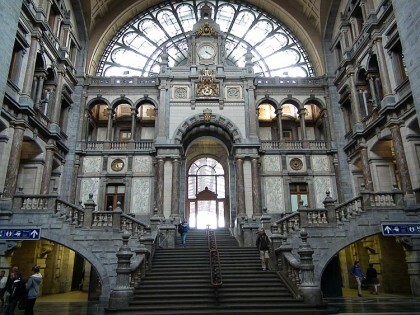 In 2009 the American magazine Newsweek judged Antwerp Central to be the world’s 4th greatest train station. In 2014, the station was even awarded by the British-American magazine Mashable as most beautiful railway station in the world.